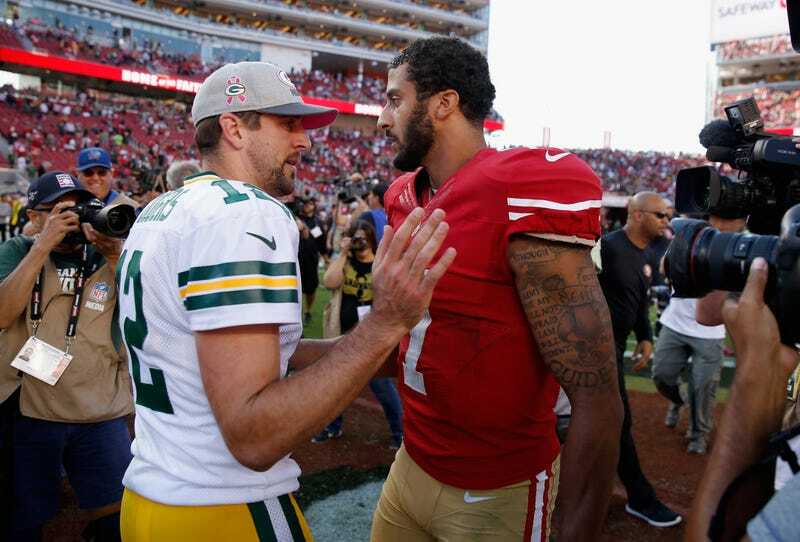 Aaron Rodgers knows that Colin Kaepernick isn’t on an NFL roster because he had the audacity to protest the killings of unarmed African-American men, women and children at the hands of police. Rodgers noted that anyone who believes that Kaepernick is still a free agent because of his abilities and not his protest would be “ignorant,” ESPN the Magazine reports. Rodgers also noted that he was trying to deepen his understanding of racial equality but did add that the country needs to “remedy and improve” racial relations. Kaepernick’s protest began in August 2016 after several killings of unarmed African-American men, women and children. Kaepernick isn’t on a team while Jay Cutler, who has trouble putting spoons into the spoon cutout slot inside the plastic utensil holder, has a job in the NFL as a quarterback. Read more at ESPN the Magazine.